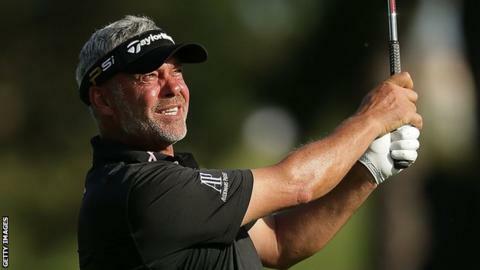 Darren Clarke moved up the leaderboard with a four-under-par round at the Australian Open in Sydney on Friday. The Ryder Cup captain carded a fine 67 in the second round, a score bettered only by Belgian Nicolas Colsaerts. It leaves 47-year-old Northern Irishman Clarke in a group of nine players tied for 14th place on even par. They are seven shots behind leader Matt Jones who leads fellow Australian Todd Sinnott by three. Defending champion Jordan Spieth is a further shot back. Spieth is on a group on three under par which includes Colsaerts and Australians Geoff Ogilvy, Aron Price and Lincoln Tighe. Clarke's second round was eight shots better than his opening 75.